Only a few decades ago, cup holders, heated seats and airbags were the niftiest new automotive features. Today, cars are being equipped with features that could fundamentally change how people get around. Some experts call the convergence of autonomous, electric and shared technologies “mobility’s trifecta” -- a three-part solution for many of the world’s biggest transportation-related issues. Most passenger vehicles sit idle for 90 percent of their lives. When they are moving, these cars typically carry a single passenger, and the extra cars with empty seats add to traffic congestion. Congestion, in turn, leads to greater greenhouse gas pollution. While driving deaths have declined in recent years, the U.S. still sees more than 30,000 people killed in auto accidents every year. Most accidents stem from human error. The trifecta addresses these issues by reducing the number of vehicles on the road, eliminating tailpipe emissions and taking the human error out of driving. A recent study by McKinsey & Company concluded that autonomous vehicles could reduce deaths on the road by 90 percent. “The benefit of the trifecta is really the maximum utilization of the vehicle in a safe, efficient way,” said Nissan Motors’ Rachel Nguyen, who spoke this fall at GreenBiz’s Verge event. 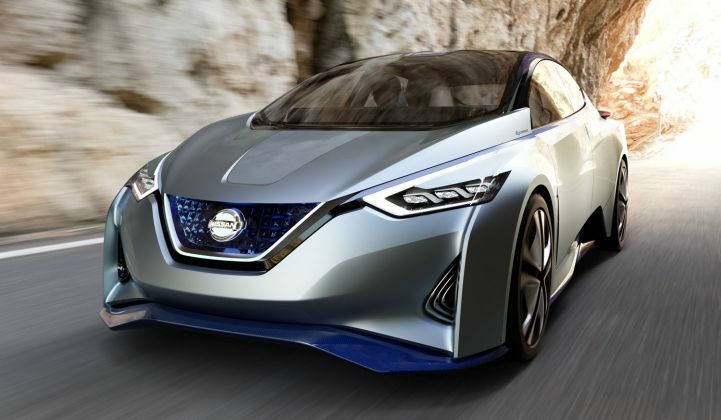 Nguyen is the executive director of Nissan’s Future Lab, the Japanese automaker’s office tasked with looking a decade ahead to identify potential issues and opportunities for the business. Fully autonomous and electric vehicles equipped for sharing are still another 10 years out, according to Nguyen and other experts. But pieces of the trifecta are already falling into place, with several developments announced in recent weeks. Nissan, for instance, unveiled the IDS concept car this fall at the Tokyo Auto Show. The IDS is an electric vehicle with a battery twice the size of the Nissan Leaf, the company’s all-electric commuter car that can travel 84 miles on a single charge. The IDS, which stands for “intelligent driving system,” also has fully autonomous driving capability. At the press of a button, the seats pull back, the steering wheel transforms into a touch-screen tablet and the car takes over. While Nissan currently doesn’t have plans to commercialize the IDS, some of the technology could end up in future vehicles. CEO Carlos Ghosn has already said the company will release several models of self-driving vehicles worldwide by 2020. Daimler has also been developing autonomous vehicle technology, and not only for passenger cars. Earlier this year, the German automaker premiered the world’s first autonomous semi-truck licensed to drive on public roads, called the Freightliner Inspiration. The truck was unveiled at the Hoover Dam, where Daimler put on a record-setting light show. At the other end of the vehicle spectrum, Daimler offers the Smart Fortwo, which is available with an electric powertrain and is used exclusively in Daimler’s car-sharing program Car2Go. The service is now in 14 cities in the U.S. and a total of 30 cities around the world. Daimler was one of the first auto manufacturers to launch a car-sharing business. It could prove to be a wise move as more drivers look to avoid the hassle and expense of ownership. There are still cultural barriers to overcome with car sharing, said Mike Mikos, director of strategic development at Daimler. But most of these barriers aren't there with younger generations. American automakers are also working on the trifecta. General Motors, which already offers the Volt plug-in hybrid and the all-electric Spark, is planning to unveil the production version of its long-range EV -- the Bolt -- in January. Next year, the company will also launch the Cadillac CT6 with “Super Cruise,” which will allow for hands-free driving. This fall, GM made a move into car sharing with the launch of Let’s Drive NYC, a program that treats vehicle access like any other apartment-building amenity. “None of these things were possible 30 years ago,” said Peter Kosak, GM’s executive director of urban mobility, in a recent interview. “All of it is driven by connectivity." Car sharing isn’t possible without connectivity, because no one is going to make phone calls and use spreadsheets to orchestrate it -- people need maps and apps. Electrification requires analytics to understand trip patterns and facilitate charging. And while autonomous vehicles rely heavily on hardware like cameras, radar and sensors, connected vehicle technology plays a critical role in enabling the exchange of information between the driver and the car, and between the car and its surroundings. The overlap makes it easy to see why autonomous vehicles are a natural fit for Google. “I should mention that I will be interviewing people personally and Autopilot reports directly to me. This is super high priority,” he tweeted in a follow-up. Tesla, which only makes electric vehicles, launched its autopilot last month wirelessly. Tesla hasn’t announced any plans on car sharing. But Travis Kalanick, the CEO of the popular ride-sharing company Uber, said that if Tesla vehicles are autonomous by 2020, he would buy up to half a million of them to serve in his company’s taxi network. Morgan Stanley analyst Adam Jonas published an investor note on Tesla in June, arguing that shared mobility and autonomous cars could help to drive EV growth, which has been modest to date. “If run by a business as a taxi service, the autonomous car can be generating revenue for as much as 40 percent of a 24-hour day in our simulations…nearly 10 hours/day on average. Some days more, some days less,” he wrote. “The higher utilization means expensive EV tech can be far cheaper on a per-mile basis." Tesla is currently targeting the premium performance car market, where cost isn’t much of a concern. But mobility's trifecta will be key to Tesla's longer-term mission to democratize electric transport, argued Jonas. “While today’s Tesla customers enjoy a high level of human driving pleasure and performance, we see the future Tesla customer enjoying mobility as a service in a model nearly unrecognizable to what we have known for the past 100 years of our relationship with the automobile,” he wrote.